Between long waits at the airport, strict security regulations, and inevitable delays, flying can be a pain even for the average traveler. And living in the Atlanta area, I know nightmare airports. It may seem like adding a gun to the mix would only make things more complicated, but traveling legally with a firearm can actually be pretty simple, if you know what you’re doing. This guide will show you how to pack your gun, ammunition, and accessories to keep them safe and legal for air travel, what you need to do at the airport to make flying with your gun easier, and exactly whose rules you need to make sure you’re following. If you use this guide and a bit of common sense, traveling with your firearm will be just as painless – well, only equally as painful – as flying without it. Get off the ground and to your destination with ease. First things first, you need to know the TSA’s rules for firearms. 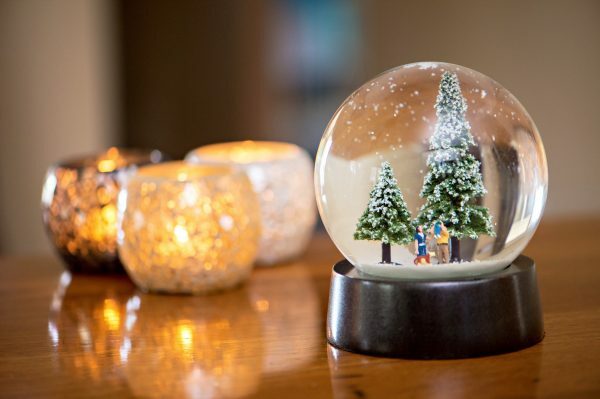 In a world where pocket knives, snow globes, and even gel insoles can’t be stored in carry on bags, it should come as no surprise that you can’t take a gun in your carry on. Too dangerous for air travel. They also must be unloaded and stored in a locked hard-sided container, which can’t be easily opened and totally prevents access to the gun. This case can then be placed inside your checked baggage or, in the case of large cases, is a checked bag itself. Multiple guns can be placed in the same hard sided case. Check out our case recommendations for a variety of solid cases for all price points. Master Lock also makes a variety of inexpensive but heavy duty lock options that you can use on your case. Mobile gun safes can also be a good choice, but be mindful of weight limits on checked baggage if you want to avoid extra fees. Bear in mind that you shouldn’t use a regular TSA approved lock used for regular luggage, which are actually illegal to use for firearms storage because they can be opened by anyone with a TSA master key. You should have the key on your person, and there shouldn’t be a copy in your checked luggage. Otherwise, what’s the point of the lock? You don’t want to skimp on your protective case for both your peace of mind and for the TSA’s. After all, your case is the primary protector of your gun while your bag is being tossed around by less than careful baggage handlers and sliding around the hold of the plane. 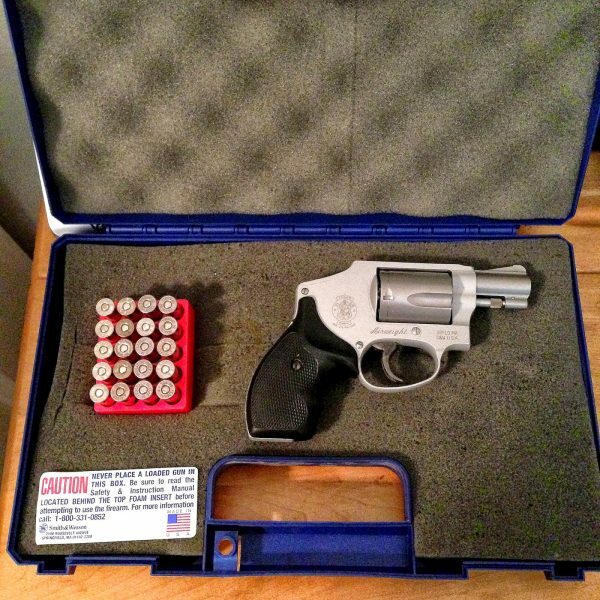 In addition to being sturdy and durable, many gun owners also like to travel with their firearms in cases that don’t obviously like gun cases in order to prevent theft. If that’s your jam, try a case that looks like it could just as easily be carrying sports equipment, a musical instrument, or small electronics. For example, a rifle or shotgun could be carried in a hard case intended for golf clubs like this one from Samsonite. Just be sure to cut foam inserts to keep everything protected and in place during transport. Once you land, large gun cases that are checked as an individual piece of luggage rather than stored in checked baggage may have to be picked up with large or unusual items, like skis, instead of with other checked baggage. Usually they’ll just come down the carousel with everything else though. Just grab your rifle case alongside your suitcase. Ammunition also has to be checked, and must be stored in containers specifically designed for carrying small amounts of ammunition. 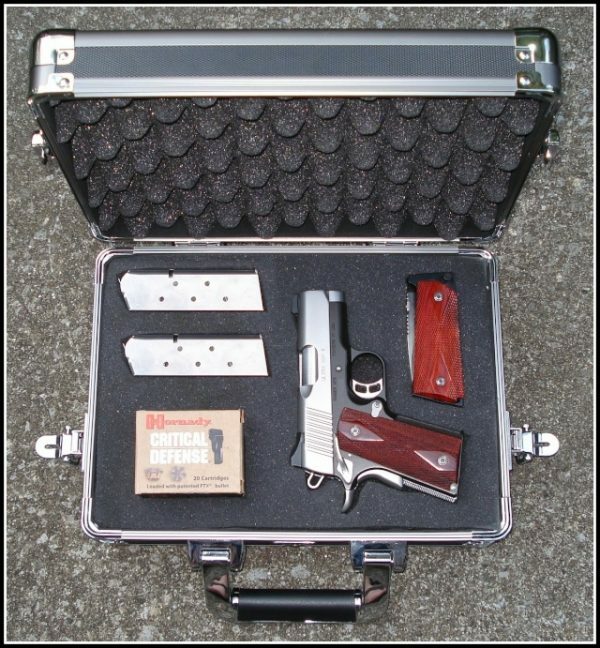 Shotgun shells and ammunition .75 caliber or less can be stored in the same hard case as a firearm (still in the container specifically for ammunition), but don’t have to be. Loaded or empty magazines and clips have to be stored the same way as guns, but firearm parts like bolts and firing pins just have to be stored in checked bags. Even though the TSA says boxes made out of flimsier materials like cardboard are alright for storing ammunition during air travel, you may want to go with a more solid container to avoid the risk of having your ammo box fall apart mid-flight, leaving your ammunition to scatter across your bag. Sure, you might be able to use every remaining piece of ammunition, place them in a new container, or leave them behind, but considering how seriously the TSA takes loose ammunition, it’s not worth the risk. Lightweight but sturdy options are going to be the best bet for most travelers. When checking your baggage, you also have to declare any guns or ammunition to the airline. 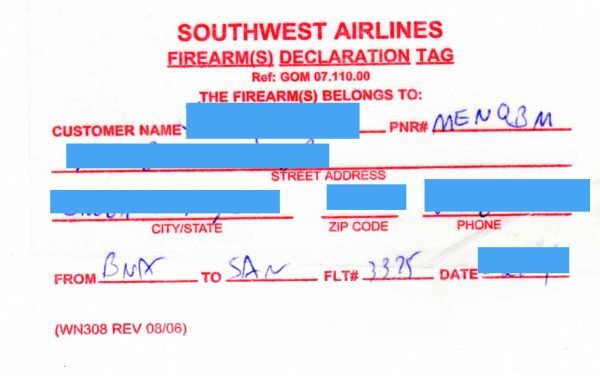 You have to do this every time you travel, so don’t forget to declare your firearms and ammunition again if you switch airlines during the same trip. 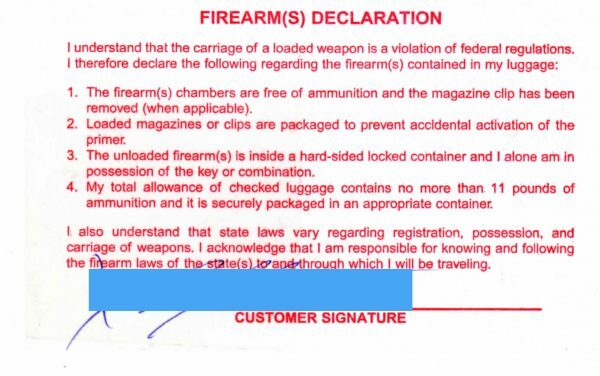 What exactly does it mean to declare your gun, though? Declaring a firearm is not a big deal and it won’t get you funny looks or suspicious treatment. After all, lots of people fly with firearms, and your gun probably won’t even be the weirdest thing the agent will have encountered since starting their shift. Just go to the ticketing desk inside the airport (you can’t declare a gun curbside) and tell the agent that you need to declare a firearm. They’ll give you a card to fill out with your contact info, verifying that you’ve properly stored your gun. The agent will then check that the case is locked. 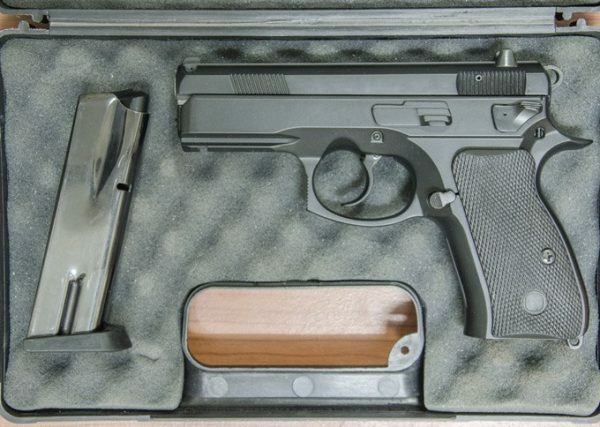 After a few questions to make sure any accessories or ammunition are stored properly, you’re usually good to go, but the agent may also want to look inside the case. You should unlock combination locks yourself. TSA and airline staff are not supposed to ask for your combination or a copy of your key. Your agent can open the lock with a key if they give the key right back to you. Remember, you should have a key on your person, but not in your checked bag. 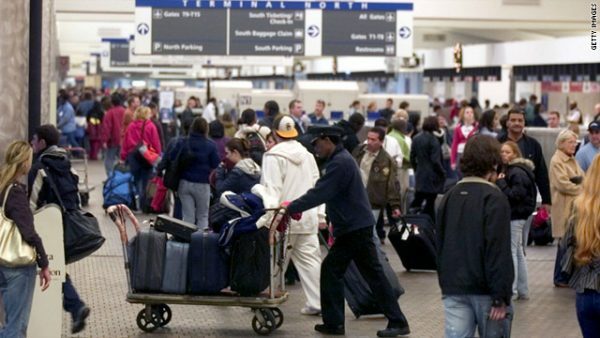 TSA and airline agents also shouldn’t handle your firearms. If they feel it needs inspection, they are supposed to call over a law enforcement officer. Once you’ve finished declaring your firearm, stick around the desk for 20 or so minutes in case they need to call you back for an inspection. If you go through security and they need to call you back, you’ll have to go through all over again. And the last thing you want to do is have to work your way through this mess a second time. Declaring is usually a quick and easy process, but you want to allow yourself at least an extra hour in case of one of the rare occasions where it does take longer. It’s much better to have more time to browse duty free stores or grab a Cinnabon than to miss your flight. Note: Air rifles and air guns are not considered firearms, but must be stored in checked bags. They do not require declaration, but air tanks must be inspected. The TSA isn’t the only person who makes rules about flying with your firearm, and you need to know which ones will affect you. 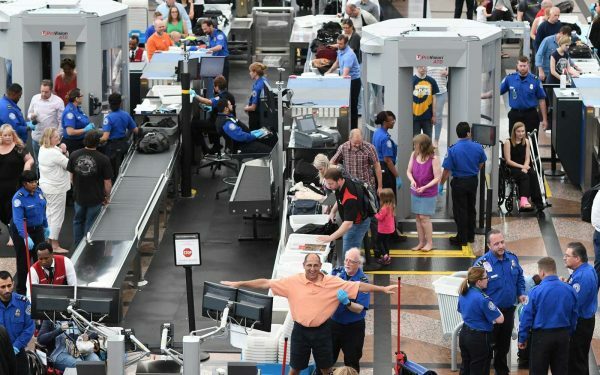 Most airlines have rules for flying with guns on top of the TSA’s, and exactly what these rules are varies from airline to airline, so you’ll also need to check what your airline of choice requires. 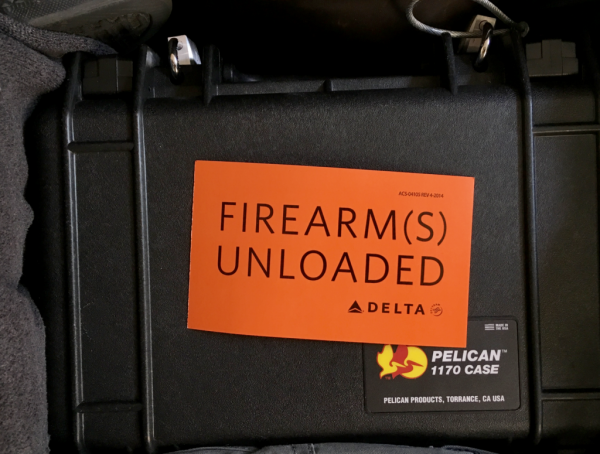 For example, Delta requires that guns be stored in a manufacturer’s case and puts a weight limit of 11 pounds of ammunition, among other limitations. American Airlines also puts an 11 pound limit on ammunition and only allows empty magazines. These rules and regulations generally be found easily by searching your airline’s name and “firearm” or “gun” or by looking on their website under the section for baggage. You’ll also need to know the laws for wherever you’re flying to. 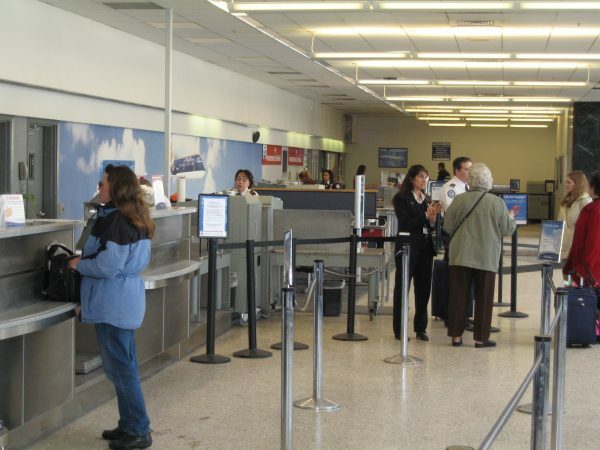 Airport staff is only checking to make sure you’re following the airline and the TSA’s rules, so even if your gun is checked legally, you may be in violation of local laws once you reach your destination. 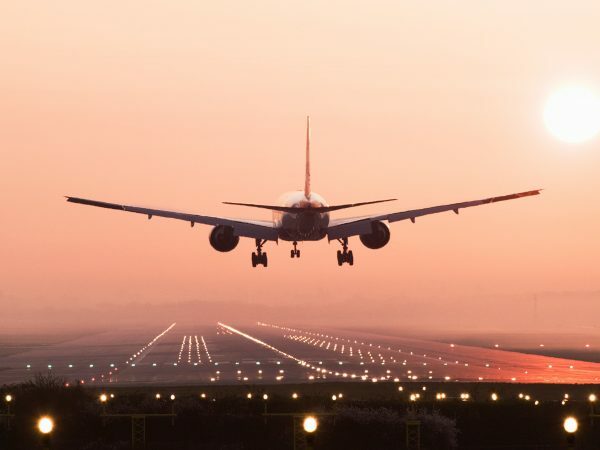 For international travel, booking direct flights as much as possible minimizes the countries you pass through, and cuts down significantly on the number of customs requirements that you have to deal with, making the whole process easier (and minimizing the chance of missing luggage). You’ll need the have the customs rules of all countries you’ll be visiting. 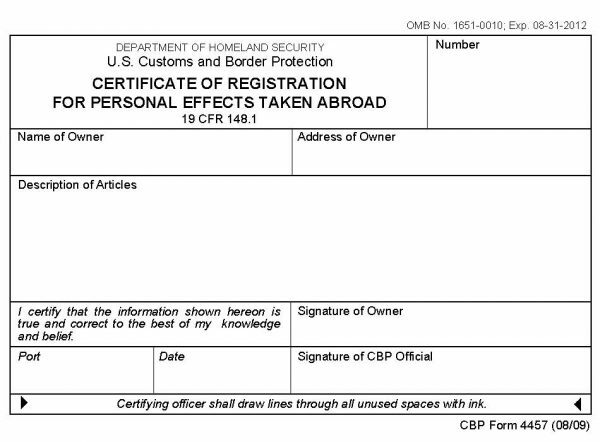 You’ll also need a US Customs Form 4457, which must be signed in-person by a US customs official before you leave. This form allows you to bring your firearms back into the country without having to pay duty on them. This is especially important for foreign made guns. This useful form can cover other foreign made items as well, and can be used multiple times, so hold on to it for future trips. You’ll want to get all this information together early so you have plenty of time to get it filled out properly before you leave, especially if you need a visa. Know the laws of wherever you’re going. That’s about it. Using this guide, you should be able to fly with your gun with relative ease, but when in doubt, contact your airline or the TSA directly. For international travel, refer questions to the local consulate or embassy of the country or countries you’re visiting. Have you ever flown with your gun? Have any tips or tricks? Let us know in the comments below! After an hour on hold with United airlines they said I could carry 11 lbs of ammo on each checked bag- not 11 lbs per individual person . I recently flew Delta. They REQUIRE TSA locks. I complied. When I arrived at destination my revolver was damaged. My bag had been inspected because I use TSA ziplocks to verify. I had to spend a half a day finding and going to a gunsmith. It turns out the gun was probably opened to check for ammo but slammed back into the frame thus causing the cylinder to become out of sync. What is one to do about TSA required locks & TSA damage ?? Just visited Delta site and couldn’t find anything stating they “require” TSA locks. TSA does currently allow them to be used, but it is a bad idea IMO. You can file a complaint with the TSA for the damage and attempt to recover it. 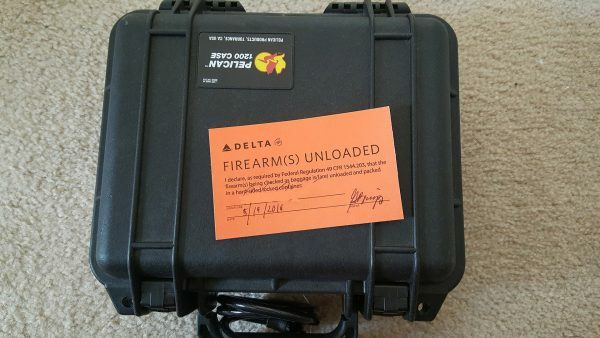 The article also states that Delta requires a manufacturer case, but that has never been true in my experience in reading their rules and flying with firearms with them. That is one of 3 options and ONLY if it is sturdy enough to protect the firearm from being accessed. Thank you for the insights. I fly with 1-2 guns when I am traveling to states that honor my carry license. Good tip on the TSA approved locks. All of mine are, but after your coments, I am switching to something that only I have the key for. If they need to open the case, is rather be there. Glad we could help out, Mike!